A common misconception is that solar panels no longer work when damaged or broken. 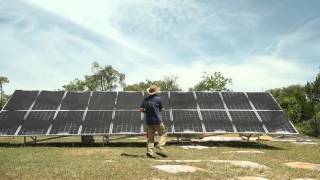 In this video we dispel this myth and also show how water applied to a damaged solar panel system can radically increase the danger of electrocution. 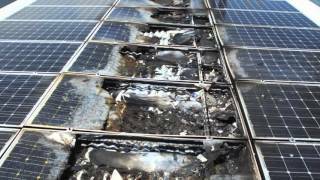 Please note that whether wet or dry, damaged solar panels can present unanticipated risks. A MUST VIEW FOR ALL EMERGENCY FIRST RESPONDERS! PVStop is both fire retardant and non-flammable. In the event of a fire, PVStop can be applied to the solar panel system to not only switch off the panels, but also to insulate the panels from fire damage. 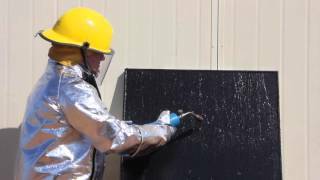 In this video you can see just how flame resistant the dry coating is as we apply a butane torch to a coated panel. A common question we are asked is how many panels will a 9 litre canister cover? In this demonstration we will show you how a 9 litre canister can make a typical domestic solar array safe in seconds. Our world first innovation PVStop is the only way to switch off solar panels at the source, making solar energy safe. 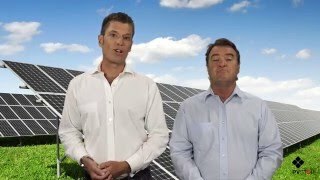 Why would anyone want to switch off solar panels? Please watch our short video to find out! Please like and share our video to help us spread awareness within the community. PVStop is non-flammable, fire retardant and shuts down solar PV systems in seconds without causing any damage to the solar panel system. When you wish to re-activate the solar panel system, simply peel off the coating to resume normal system operation. PVStop is a fire retardant solution that acts as a liquid blanket to make solar panels safe. 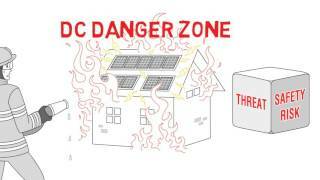 In the event of a short circuit or an emergency (such as a fire or flood) solar panels continue to produce potentially lethal amounts of DC voltage. How Does it Work? Please watch this video.